Ik vind ze zooo geweldig , de nieuwe gorjuss stempels, krijg er geen genoeg van!! En ik hoop dat ze ook al bij jullie op de mat zijn gevallen want Sugar nellie heeft alle pre orders op de bus gedaan. Heb je ze nog niet besteld, ze komen eind maart los in de verkoop bij Funky kits! Ik heb hier de nieuwe papiertjes van MME (bloom & Grow) gebruikt, en lekker veel plakparels en kleine roosjes! Oh my, I can't get enough of these gorjuss Girls!! They are so cute!! I hope most of you have got yours!! 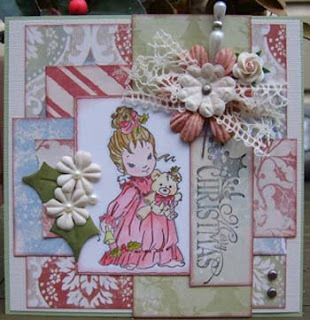 I have used new papers from MME (bloom and grow) and lots of pearls and little roses! Eindelijk vielen de Gorjuss stempels op de mat en ik voelde me vandaag goed genoeg om even boven te zitten en ermee aan de slag te gaan! Toen was het nog moeilijk met welke te beginnen, maar deze sprong er voor mij al meteen uit. Zo kon ik ook meteen werken met de splksplinter nieuwe papiertjes van Dream Street, die van de week bij Simpel-Scrappen waren binnen gekomen! En nu eerst maar de troep opruimen zodat ik morgen weer verder kan met deze geweldige gave stempels van Sugar Nellie! Yessss, they arrived here finally this weekend, and I'm feeling well enough to play with them... aren't they gorgeous???? I couldn't choose which one to go first, but this one with the letter in her hands won! 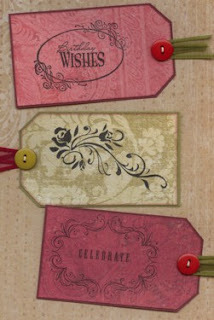 I've used brand new papers from Dream Street-Fresh, and the sentiment is from Hero arts. Now I have to clean up the mess overhere, so I can play more tomorrow! Deze keer deed Angelique de scrap online omdat ik nog steeds herstellende ben. Maar kon het toch niet laten om mee te doen.. Het is een stuk makkelijker als iemand al voor je heeft nagedacht en ik vond het geweldig om te doen... Weer een schitterende stempel van Sugar Nellie... Ik vind hem sooo cute! Het papier is al een oudje uit de chatterbox lijnen. 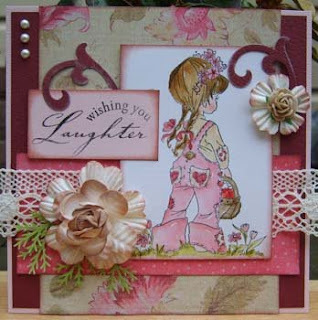 This time Angelique did the scraponline because I;m still recuperating from my operation, but I couldn't resist playing along with all the others.It was so much fun!! It is easy when somebody has done everything and you only have to make it the same way! 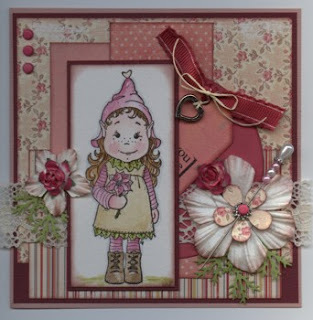 Isn't it a lovely stamp from Sugar Nellie? And those papers are oldies from chatterbox. 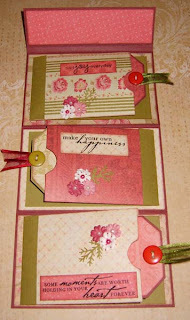 Before I went to the hospital, I've got the 2 cardkits from Simpel-Scrappen and made these cards with it. 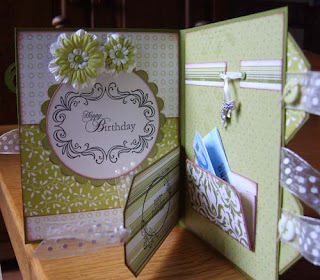 and these were made with the new papers from Imaginisce. I;m stil very tired every day and the pain is still there, so I can't make cards yet hopelfully soon! Thank you all for the lovely words and commends about my surgery, i feels so good you all thought of me! Yesterday I came home from the hospital, I'm feeling not well yet and the operation went okay but not the way it should..I have a great cut in my bellie instead of 3 little wholes, It still is very painfull and I can't sit very long . Now I have to recover from everything and hopefully I can make cards soon because I miss it! I read that the gorjuss stamps are on it's way to me so I must be better a bit then.. I want to thanks everyone for the loving words , cards and emails before I went to the hospital. It was so heart warming! I've got over the 100 cards, a lot af flowers , candy and so much more, it will help to recover soon! 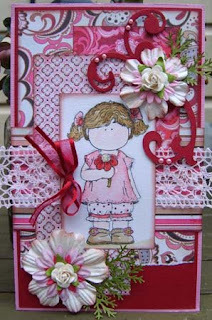 Offcourse you have to use a sugar nellie stamp! Goodluck everone! 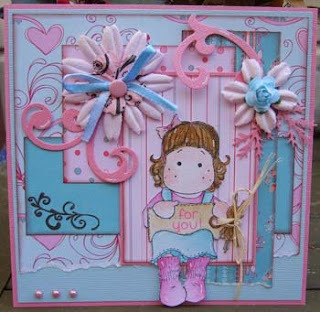 We did a scrap-online again tonight, and this was the card I've made. 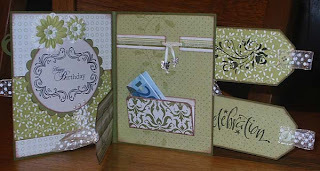 The papers were in the cardkit from Simpel-Scrappen and is soooo lovely! 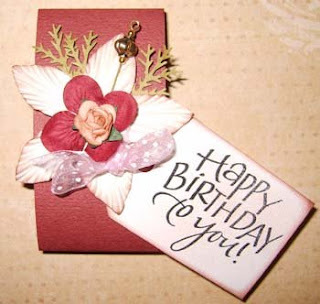 And I love those little roses!! The flowers I have colored with glimmermist but you can't see the glitters very well on this picture. I hope to see you all very soon, tomorrow is my surgery and hopefully I will be back before the weekend! Take care everyone and I want to thank everyone who send me emails and comments about the surgery, it feels good that you all care. 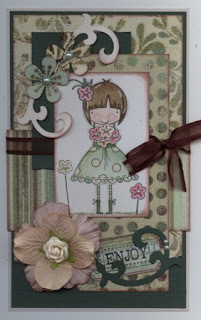 O by the way, thursday will be the new challenge on the Sugar Bowl blog..so don't forget to watch! Voor de club heb ik deze workshop gemaakt, Het is geen idee van mezelf maar zag zoiets op een site en heb er mijn eigen draai aan gegegeven! Het papier is van K&Company heerlijk romantisch en prachtige warme kleuren. Wil je weten hoe dit is gemaakt, kom dan een kijkje nemen op de club. This labelpurse is a workshop on my club. I saw the idea somewhere on the internet and made it some different ! 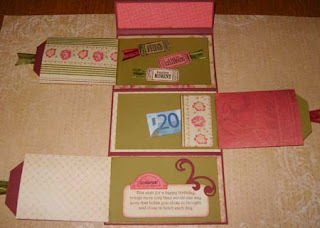 The papers I've used are from K&Company, romantic and warm colors! 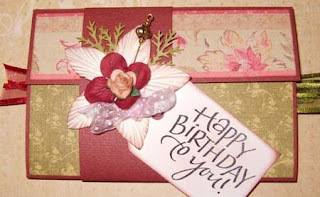 This is a happy birthday purse but it can be also for someone who is been ill with some tea bags in it! Have a lovely sunday evening. I will be hanging on the couch and whatch CSI and Numbers. 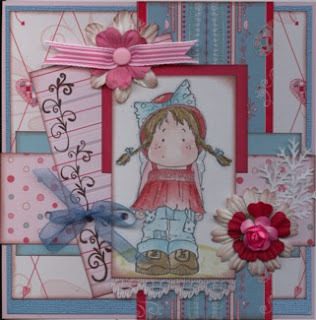 Again another gorgeous new stamp from the sugar nellie range!! Isn't she cute?? 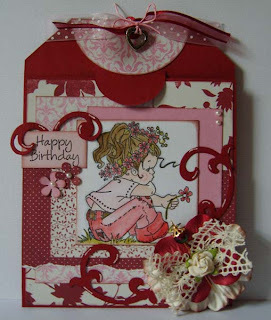 I couldn't resist to start making a new card today with one of the 4 new stamps, designed bij Elisabeth bell.. I'm busy making my house clean, the laundry done,etc because tuesday the 10th of Februari I have to go to hospital for a gall bladder surgery.. I have to be there a couple of days and hope to be back home before the weekend. 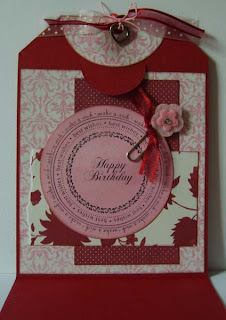 But hopefully I can make some more cards this weekend because they are so great playing with! 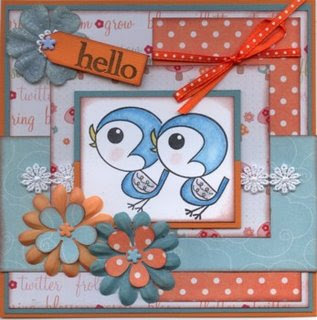 Ohhh what are those new Sugar Nellie stamps cute!!! 4 brand new stamps are now in stock! I've used the making memories papers with a lot af glitters-Garden party! She is so adorable don't you think?? I love coloring it with distress ink en som colorbox pads. Thanks for looking and all the lovely comments every time! 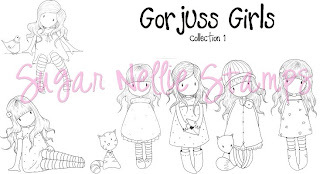 and they have opened the pre-orders for the Gorjuss Girls HERE, you will have until February 16th to order !! The new challenge for my club started the first of februari and this was the sketch I've designed. My team and myself had made some cards with the sketch and these 3 are mine. 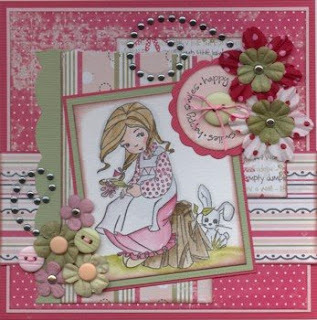 Bittersweet papers and magnolia..a great combi! Yellow Bicycle Christmas papers and Mrs Sante from Magnolia. 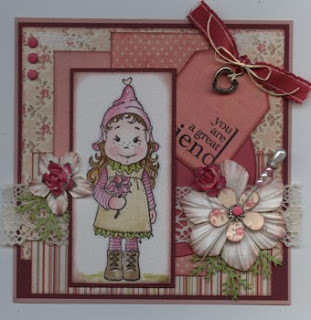 papers from My minds eye and Blossom stamp from Leanne Ellis design. And then the great news about the Gorjuss stamps! They are on pre-order from FUNKYKITS this thursday.. so keep your eyes peeled for that all important mail in your inbox! I hope my Dt stamps will be here soon Bcause thye are soooo Gorjussssssssssss!! 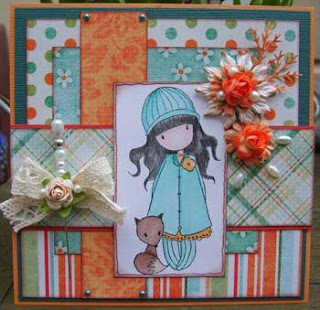 Tonight there was another scrap online and this card I had made as an excample... All the hints I gave were followed, and Oooo all those cards were just so gorgeous they all made! 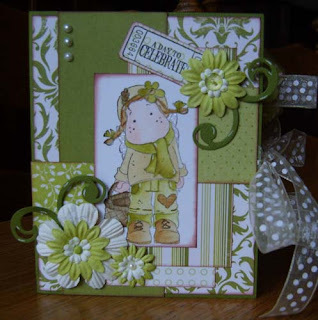 !I had used papers from K&Company and a lovely stamp from Magnolia. 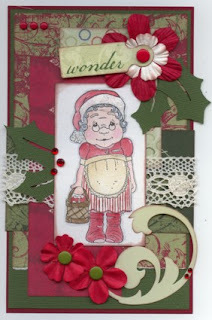 I've colored with distress ink an the sentiment is a stamp from hero arts. have a nice evening, and thanks for looking! 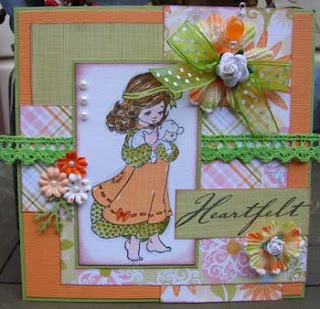 The papers I've used are from a paperpad from Making memories...just lovely colors in it! And offcourse I picked one of my favorite stamps at the moment-Daisy! I've colored here with distress ink. I hope you will join in and I can't wait to see wha t you make of it!